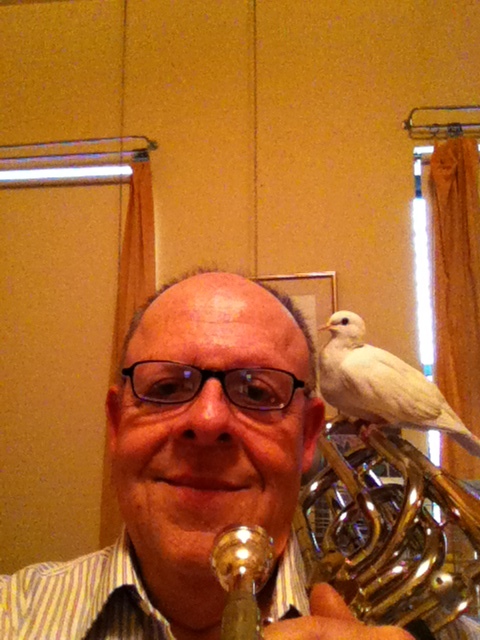 Jim plays bass trombone and joined QUO in November 2011. Several years ago I was asked to sub by Jim Babcock for one concert and ended up being called for just about all of them. I like the High Line, the various art museums, an off-Broadway play, Central Park and the Bronx Zoo and Botanical Gardens. I am tempted as a trombonist to say “very long rests” but probably “ff.” I am kind of excitable and tend to be a bit loud at times. My first trombone came to me in junior high school as my dream-come-true instrument and I continued to play it through college. I then stopped for about 35 years and during that time did a great deal of composing. I picked it up again about 5 years ago at the suggestion of a musician friend and became enamored of the bass trombone in particular. I just have a ball playing it. Question from Laura: What has been your favorite piece you’ve played with QUO and why? That is a tough question, since we play so many good pieces, but I would have to say so far it has been Copland’s 3rd Symphony. Besides being a great masterpiece of American music, it has wonderful parts for the trombones that are really hard but satisfying to play.